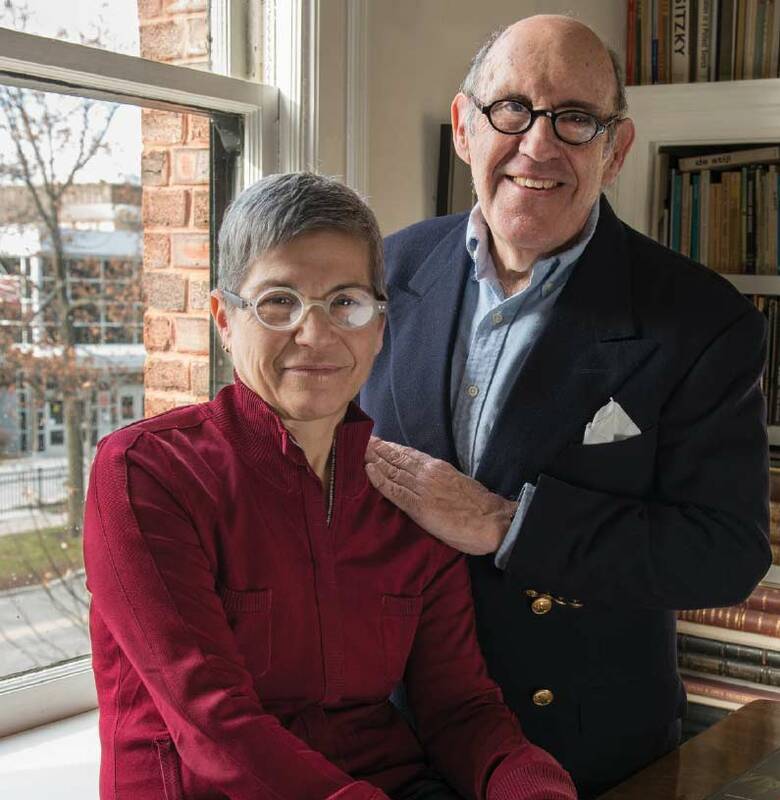 At home in Evanston with venerable architects Stuart Cohen and Julie Hacker. So there’s this goose lamp … a painted-plastic, garden-variety, white-cord-dangling whimsy that you won’t see it in any of Stuart Cohen and Julie Hacker’s designs for their clients. Cohen’s joking around, but in some small way, the silly lamp did signal synergies to come in the partnership. Evanston-based Stuart Cohen and Julie Hacker are one of the Chicago area’s dynamic architecture and design duos, the team behind some of the North Shore’s most beautiful new homes and renovations. With so many grand structures to their credit, one wonders what it’s like in the living space they share. In three words? Comfortable, eclectic, and storied. Cohen and Hacker met in 1981 when Julie was a graduate student in architecture at UIC and Stuart was a professor. After graduation, Julie spent a few years working for Hammond, Beeby, and Babka and did summer stints for Cohen as well. When Cohen needed an associate with at least two years of experience, “‘Julie said, “You’re hiring me!’” says Cohen, smiling. He did indeed, and a romance blossomed. The two were married in 1986. Traits that complemented one another made some of this easy: Stuart’s a collector. Julie’s not. Stuart leaves stuff laying around. Julie does not. “The way I see this is like a layering of personalities. But we’re very close in our ideas about design and I’m happy to live vicariously through the houses we build and the collections of others,” she explains. So Stuart’s bibliophile tendencies went unchecked. “You could say that some of the design of this space was really dictated by my love of books,” Stuart allows. 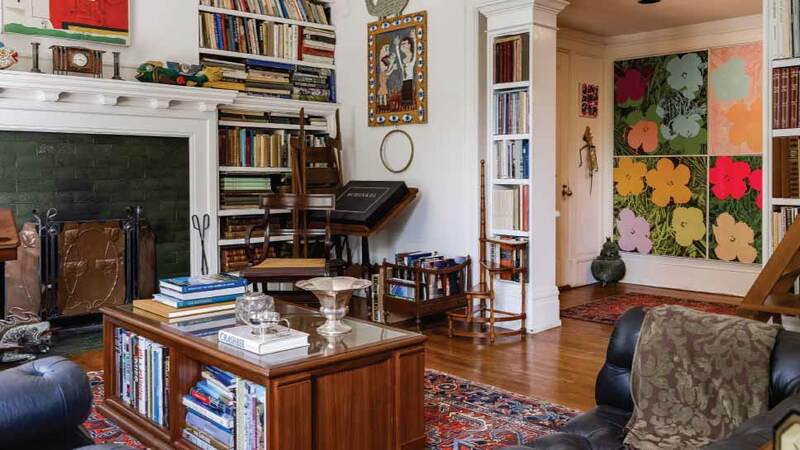 Two built-in bookshelves on either side of the living room fireplace were followed by two more on the opposite side of the room. 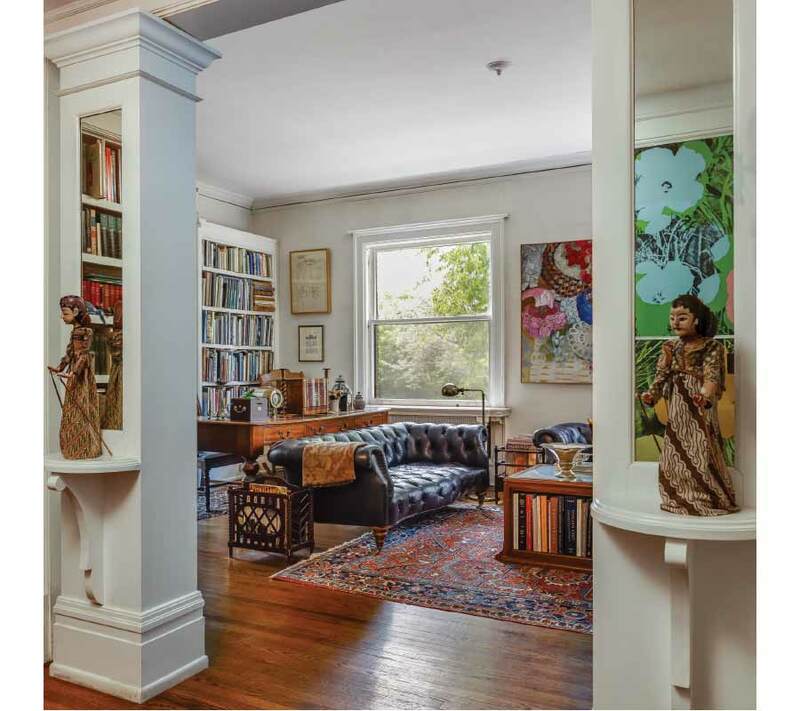 When those filled, they drew up designs for two multifunctional bookcase columns: Bookshelves face the living room on one side of the classical columns; mounted mirrors brighten the entry alcove on the other. With so many books, Cohen’s collection of library ladders makes sense. One is a highly-collectible English Regency chair that opens to become a ladder, another an antique library ladder from France and a third—a metamorphic chair designed by Cohen, riffs on a classic Shaker “ladder backed” chair, expressing the chair’s function. All are handy for sitting near, or, climbing up, the shelves. Both Hacker and Cohen enjoy travel, picking up brightly painted wooden sculptures in Mexico, shadow puppets and marionettes from Indonesia, and outsider art from here and there. They also have a growing collection of wall art. Paintings, drawings, mixed media, and photographs line the walls of the central hall, bedrooms, and oak-paneled dining room, which has as its centerpiece a massive 15th century walnut table Cohen found while in Arrezzo, Italy. Many of the works are by the couple’s favorite artists: such as painter Susan Frankel and photographers Melissa Pinney and Barbara Ciurej. And some of the most compelling pieces are mixed media by Cohen and Hacker’s son Gabriel Cohen, now artist-in-residence at the Alternate Worksite in Roanoke, Virginia. But the pieces all make sense together, and fit the couple’s shared vision. “This painting by Frankel, for example, is a layering of representational objects that create deep space, and in our architectural work, we are using traditional elements, but we are interested in modern space,” says Hacker. “In other words, the space becomes the primary mover and shaker. Our work is about that and so is our home.” Likewise, the Warhol flower prints at the entry alcove connect with tangles of William Morris foliage in three different wallpaper patterns proceeding from the front of the apartment to the rear-located kitchen. The rooms that have undergone the most recent renovations are the kitchen and baths. Contrasting with the eclecticism of the art-filled spaces, all are bright white with a bit of grey-toned William Morris wallpaper in the kitchen. Redoing the kitchen and bathrooms in their apartment, the couples echoed design decisions they have made in the homes of their clients, such as completely tiling kitchen walls, using English Edwardian style plumbing fittings, built-ins for storage, installing an extra deep kitchen sink, and ensuring that the trim and molding echo the style found throughout the rest of the house. I love this “choreographed clutter” – that’s perfect!